The problem with boxed compilations such as this is that you have to accept that not everything can be to your own particular taste. Some CDs are better than others. This particular set is a spectacular example of such a premise. Karajan is such an iconic figure and the orchestral playing throughout is magnificent but the set as a whole is unsatisfactory at a number of levels. This is a mixed bag indeed. The Beethoven cycle with Weissenberg was heavily criticised on its first release. I’ve never heard these recordings before and I feel that some of the criticism is over the top. Having said that, it doesn’t make for agreeable listening. The opening of the first concerto sets the tone for the rest. It’s slow and lifeless. There’s a concentration of effort into making everything note-perfect but the spirit of the music is sadly missing. The close, intimate recording doesn’t draw you in. It merely highlights the fact that what we have in this cycle is somewhat dull, heavy-handed and unheroic. The execution is marvellous but that’s not the point. After this, it was a pleasure to listen to the Triple Concerto. This is a great performance of a neglected work. The all-star trio and orchestra are on fire and just listen to the incredible cello solo in the slow movement. It’s probably the best version around and it’s certainly a personal favourite of mine. Speaking of cello solos, the Karajan/Rostropovich Don Quixote is another true classic of the gramophone. This sits proudly alongside the Tortelier/Kempe/Berlin Phil version from the late 1950s. The recording is crystal clear with a rather close soloist but the end result is marvellous. Maurice André is in sensational form in the disc devoted to trumpet concertos. OK, the harpsichord is a huge monster of an instrument and the orchestral playing is of the full fat variety but it sounds just great. Those who prefer lighter textures should beware. This is what baroque music-making used to sound like prior to the emergence of the period brigade. The same is true with regard to Mutter’s Four Seasons. This was Karajan’s last recording for EMI. The Vienna Phil plays with a ravishing tone but it may not be everyone’s cup of tea – indeed it’s closer to a cup of soup: thick, creamy and delightful. This brings us neatly to the Mozart wind concertos. In August 1971 whilst in Switzerland with the Berlin Phil, Karajan recorded a series of Mozart's concertos, featuring principals from the orchestra. Recorded in a church, the sound is very full indeed but also somewhat opaque. The orchestral playing is thick and heavy-handed with very little by the way of sparkle and lightening of textures. This is old-fashioned Mozart playing - smooth as silk, a marvellous singing legato but just too dense and full-toned. The soloists are superb and James Galway is instantly recognisable in the ravishing flute and harp concerto. The recording of Tchaikovsky's First Piano Concerto, again with Weissenberg, starts off with a disastrously slow tempo. It’s bogged down from the word go and in all honesty it never really recovers. The playing is littered with unnecessary interpretative touches and it takes itself far too seriously. The Rachmaninov is somewhat better but how the piano survived the brutal assault of the opening bars I will never know. The recorded sound in both is garish, close and uncomfortable. The performance of the Franck Variations is, yet again, far too serious and Brucknerian. Why is everything so grumpy? Better versions of all three works are to be found elsewhere - Katin’s old Everest version of the Franck, just reissued on Everest, is a far more pleasant experience. Let’s finish on a high note. Kremer’s Brahms is a stupendous performance, one of a handful of great recordings of this wonderful concerto. 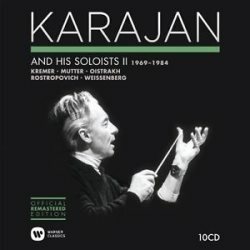 How could Karajan produce work as brilliant as this compared with his efforts with Weissenberg? I urge anyone who doesn’t know this recording to search it out. The sound quality is natural and warm with the soloist having just the right presence in the stereo image. In terms of this box set it’s just too little too late. To summarise, there is simply too much dead wood in this box to fully endorse it. The Brahms, Strauss and Beethoven Triple are stand-out discs. The rest of the collection is less attractive. Berlin Philharmonic Orchestra, Vienna Philharmonic Orchestra* and Orchestre de Paris**/Herbert von Karajan.